radiocarolinemedia | hey... What's Going On ? Radiocarolinemedia (RCM) is a publishing and events company / press agency*. 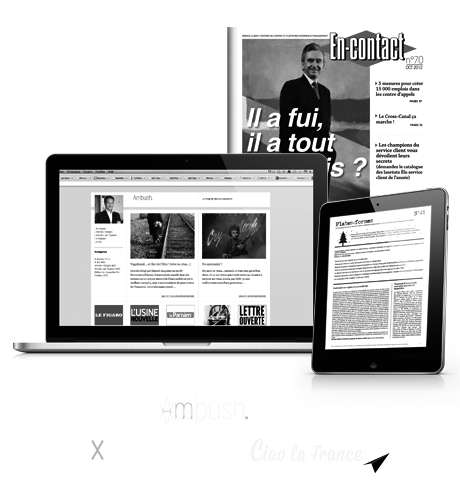 En-Contact is the professional magazine dedicated to the decision-makers of the customer relations. Now with over 11,000 subscribers, a diffusion on major trade fairs and industry events, a handling rate of 3.4 readers per copy, and more than 25,000 readers in the French-speaking world. Distribution of 9,000 to 11,000 copies according to the numbers. The letter of confidential information on Customer Service and the CEM is disseminated every other Thursday as an electronic format. This bi-monthly newsletter informs the 2,000 international leaders in the customer relations field through its exclusive news articles on the sector. Opening rate of 57%. Ambush.fr is a general information blog. They love or have loved ... And yet, they decided to leave France. owns and publishes several others media and Blogs (General or business news). an award created by Viséo Council, a society dedicated to the consultation and training in customer relations. En-Contact is the professional media partner of this event since it’s inception. the only recruitment fair specializing in the customer services domain. En-Contact has been the professional media partner of the event since it’s inception. L’Express will be released in April of 2013 with an additional 52 pages on customer service and its industry. This is an exclusive collaboration with the teams of En-Contact in which we can assure the editorial and management of this edition. En-Contact has been a partner for 3 years with the African Client Relations and Call Centers Fair, which is held in Douala, Cameroun. Benray Radio Caroline Media Ltd.